Last week I had tweeted this picture and I promised that I would have followed up with a post, so here I am, as promised. 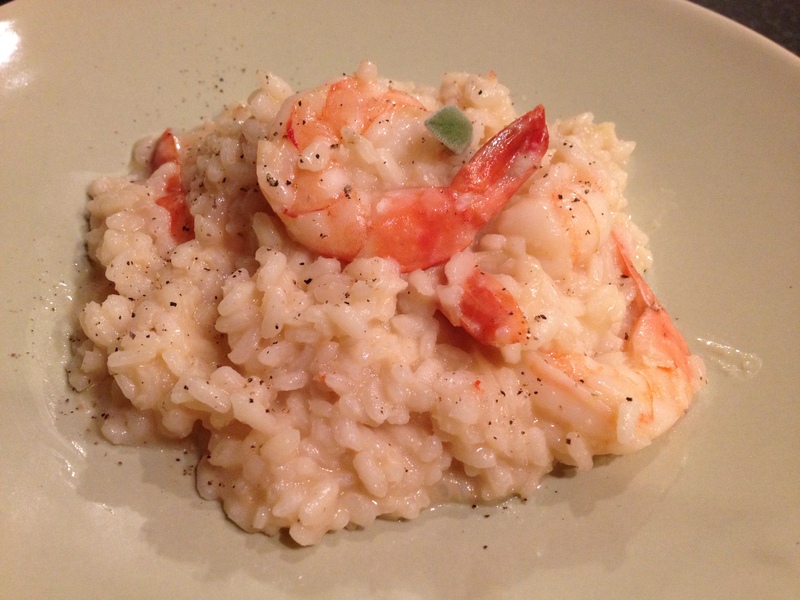 Risotto ai gamberi (Risotto with shrimp) is one of my favorite dish to prepare. It is comforting and fresh at the same time, perfect for Spring. To me it represents the fusion of Northern and Southern Italy, a good example of Mediterranean diet and just simple goodness. 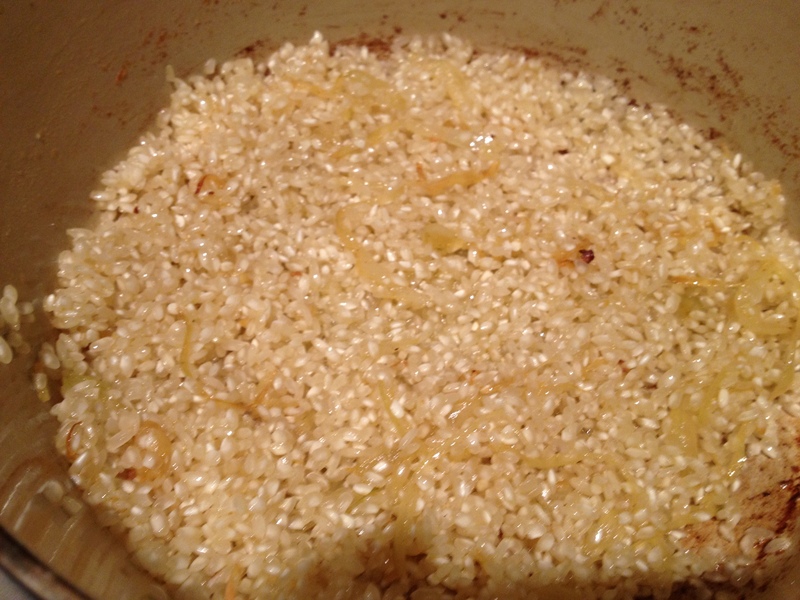 Risotto is a way of preparing riso (rice) rather than a recipe. The archetype of risotto is “Risotto alla Milanese“, you know. 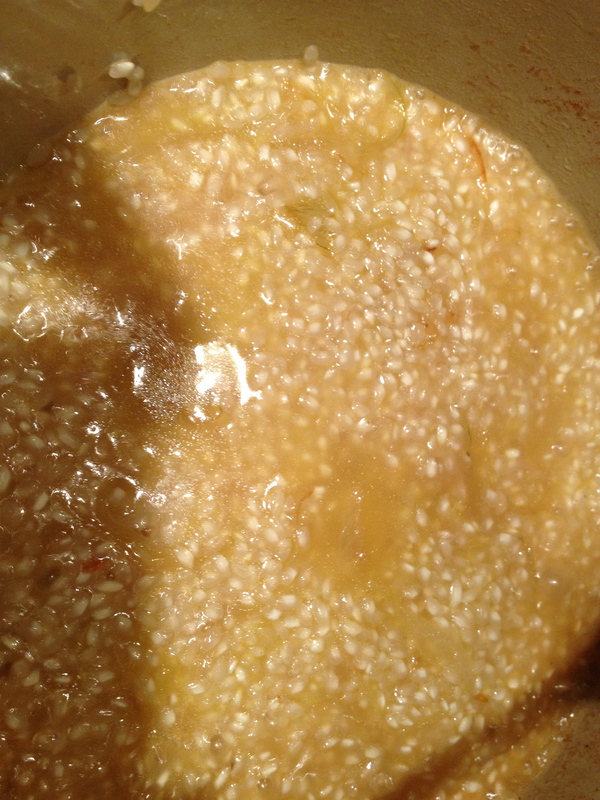 . . that wonderful yellow risotto – with zafferano (saffron) – that is always married to the “Ossobuco“. Although the Northern Regions of Lombardia and Piemonte are the capitals of rice, the use of the rice in cooking started in Naples (yes, I know I am biased!) where it was brought by the Spaniards in the fourteenth century. The Neapolitan, however, rapidly became “mangiamaccheroni” (pasta eater) and the rice soon travelled North. In Northern Italy, in particular in the wet Valle del Po (Po Valley), the cultivation of rice found the perfect environment. The immage of the flooded risaie (rice field) are quite impressive. In 1949, the Italian movie Riso Amaro (Bitter Rice), nominated for the 1950 Academy Award for Best Motion Picture Story, was shot in the countryside and rice-fields of the Po Valley. The story deals with the vicissitudes of the mondine (rice-weeders). Yet, how can we forget the Sartù? It is one of the richest and elaborated piatti (dish), based on rice, of the traditional Neapolitan cuisine. In the ‘700, Naples was ruled by the French Royal House of Bourbons. The chefs of the Royal French Court developed this recipe; its original French name was Sur-Tout which then became Sartù. The Sartù is a sort of rice dome stuffed with meatballs, sausage, peas, mushrooms, boiled eggs, mozzarella and more. . . my husband’s grandmother – nonna Lucia – used to make it and my husband still rave about it. I am not ready yet for this elaborated preparation but I promised myself that one day I shall try. I will keep you posted. Back to the rice, there are different varieties of rice: riso tondo or comune (round rice or common), riso fino (fine-rice or rice up), riso semifino (semi-fine rice), riso ultrafino (grain rice, super fine). The variety of rice you use will affect the recipe. 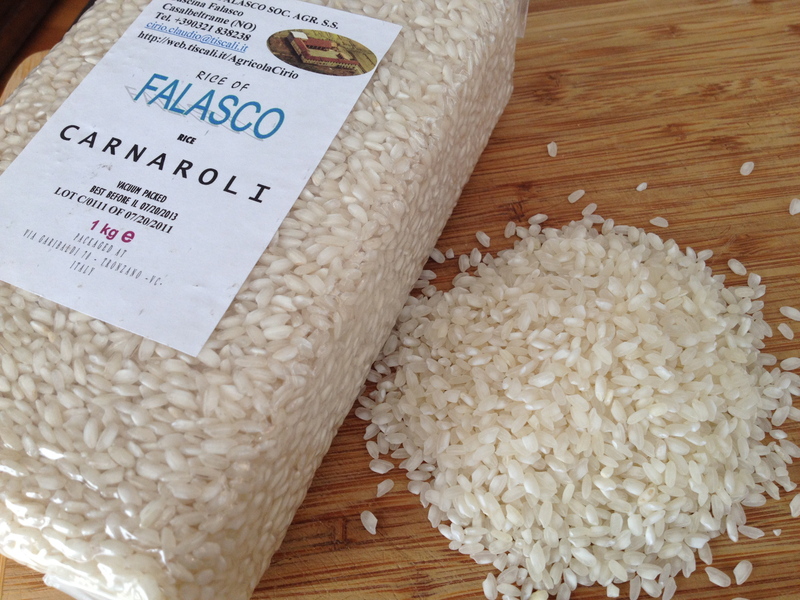 The best rice for risotto is the Vialone Nano, which belongs to the semifino variety. Arborio and Carnaroli, both in the ultrafino variety, are good alternatives. The Vialone Nano has medium long grains and it has a good ability to release the starch that ensures the creaminess of the risotto. The Arborio and Carnaroli have large and long grain and release less starch. Once you master the art of preparing the basic risotto, you can let your imagination fly and create any combination you like. 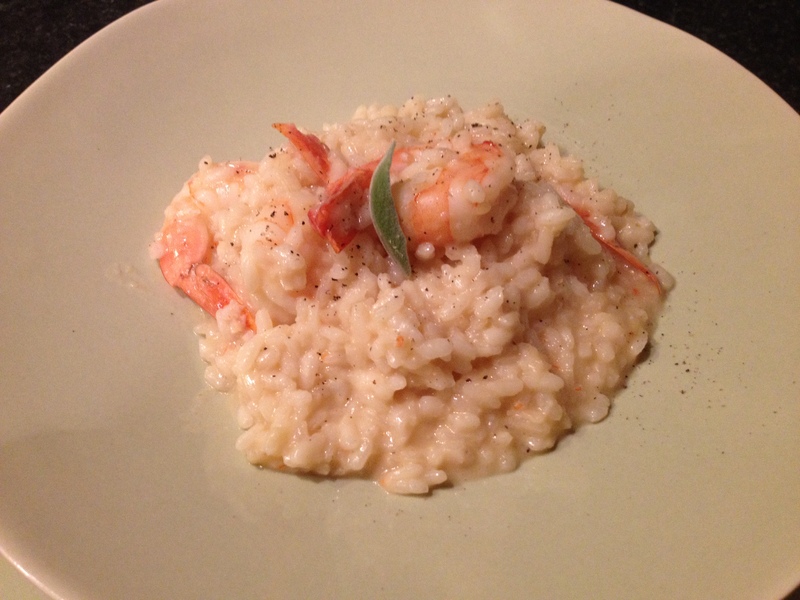 I am from Southern Italy and yet, Risotto is one my favorite dish. I make risotto with anything I fancy and anything that it is in season: asparagus, radicchio, lemon, beans, zucchini, potatoes, peas, artichokes, mushroom, butternut squash, safron, gorgonzola cheese, cuttlefish ink, seafood. . . and of course with shrimp! In my recipe, Risotto, the most typical preparation of Northern Italy, meets the flavor of the Mediterranean Sea and the culture of fish of Southern Italy . . .what better combination! 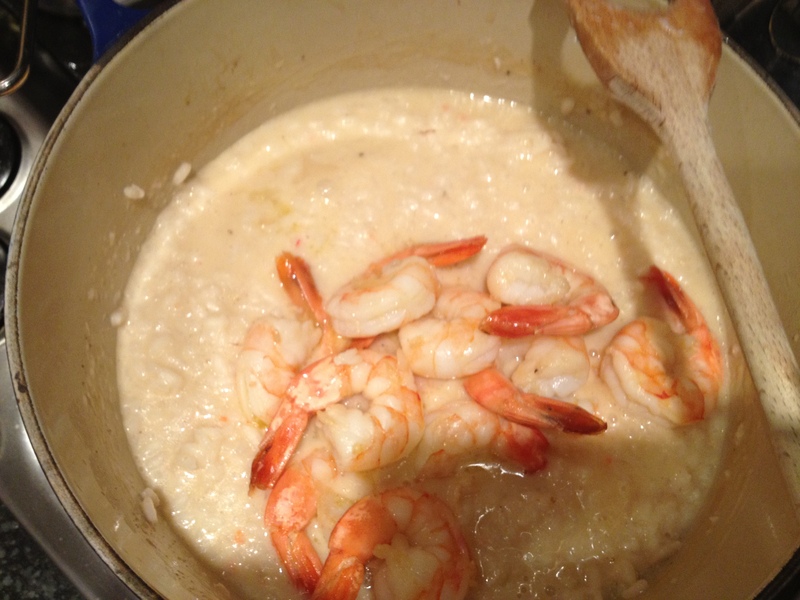 So here it is, for yet another meatless Friday (or meatless Monday), I give you My Risotto ai Gamberi. This recipe is my own, I have experimented through the years and although it is not the canonic recipe, it is my family’s favorite. To me, that’s all that matters. I hope you will give it a try, I am sure you will love it! Peel the shrimp and remove the head. I like to leave the tail but you can remove it if you want. 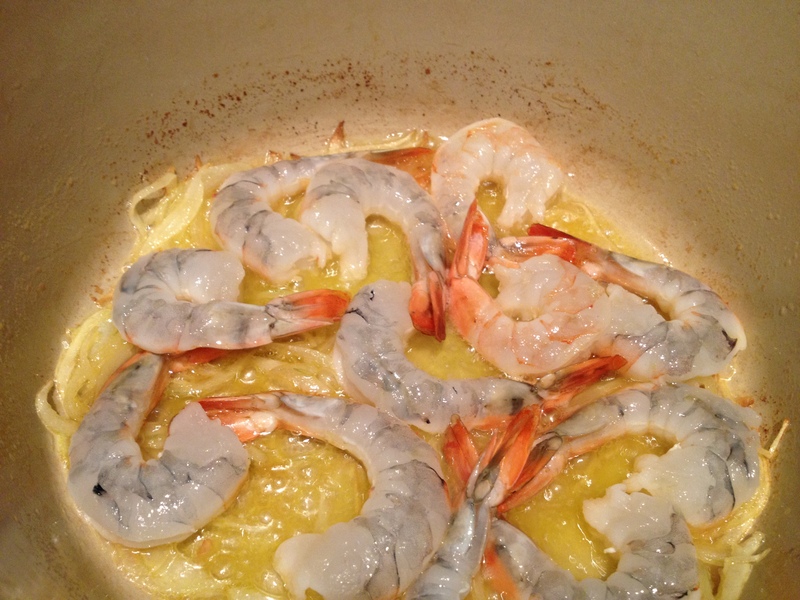 In a sauce pan heat 2 tsp of extra-virgin olive oil and add the skins and heads (and tails) of the shrimp. Add the onion and leek, stir to coat with oil. Add the cold water, the black pepper grains, and the 2 teaspoons of tomato paste. Stir to dissolve the tomato paste, this will give the risotto a pretty pink color. Bring to boil and let simmer for 20 minutes, add salt to taste and keep it warm. In a heavy-bottom pan, heat the oil and 2 tbsp of butter with the onion. Once the onion has softened add the shrimp and and cook on both side until they had taken on color. 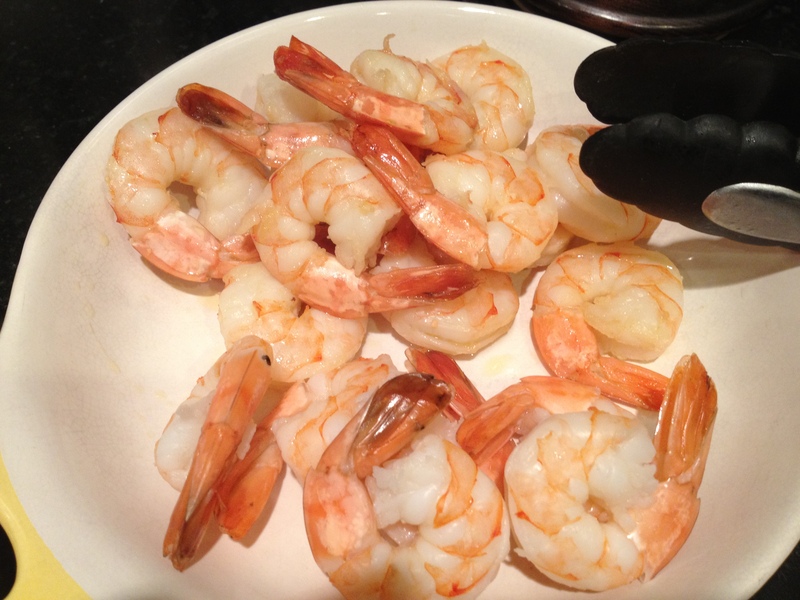 Remove the shrimp from the pan and set them aside keeping them warm. 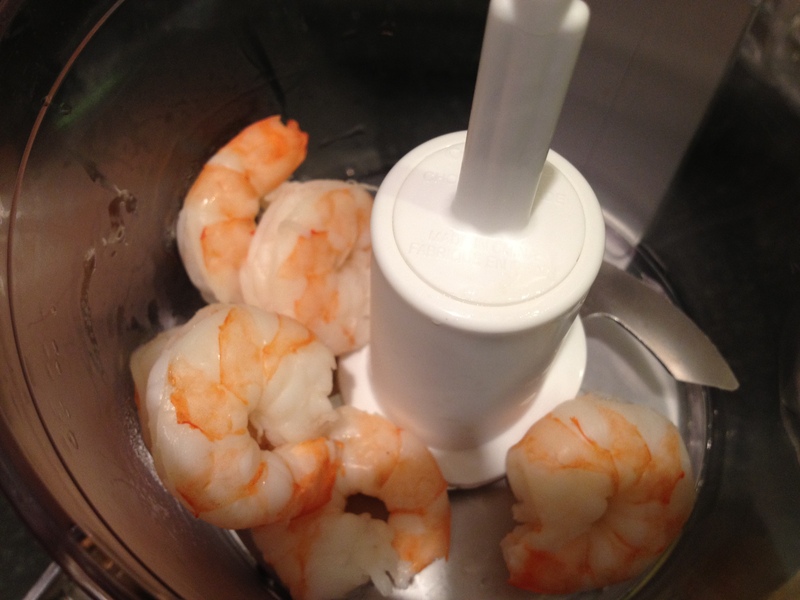 Take eight (8) of the shrimp and transfer into the bowl of a food processor, add 1/4 cup of broth and purée the shrimp. Add 1/4 cup of heavy cream and blend together. Set aside. Add a 1 tbsp of butter and scrape the bottom of the pan to release the bits of shrimp. Add the rice to the pan and toss to coat with the oil/butter. When the rice is translucent, add the wine and stir until the wine evaporates. Strain the broth and start adding 1/2 cup at the time, stirring with a wooden spoon, until all of the liquid has been absorbed. Continue adding the broth 1/2 cup at the time, stirring constantly. 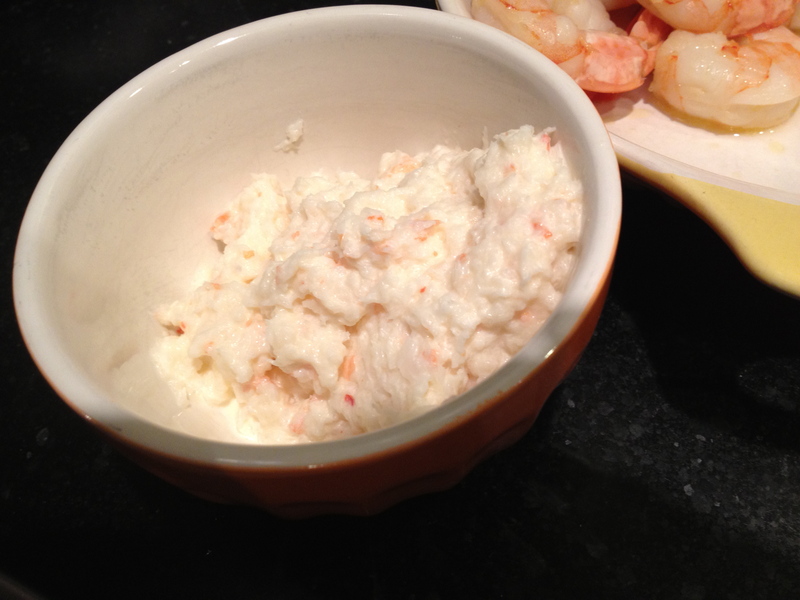 After about 15 minutes, add the shrimp purée and the whole shrimp. Stir to combine and continue cooking and stirring for additional 2-3 minutes while keeping adding the broth as necessary. Taste the rice for texture and seasoning, it should be al dente, tender but not mushy. 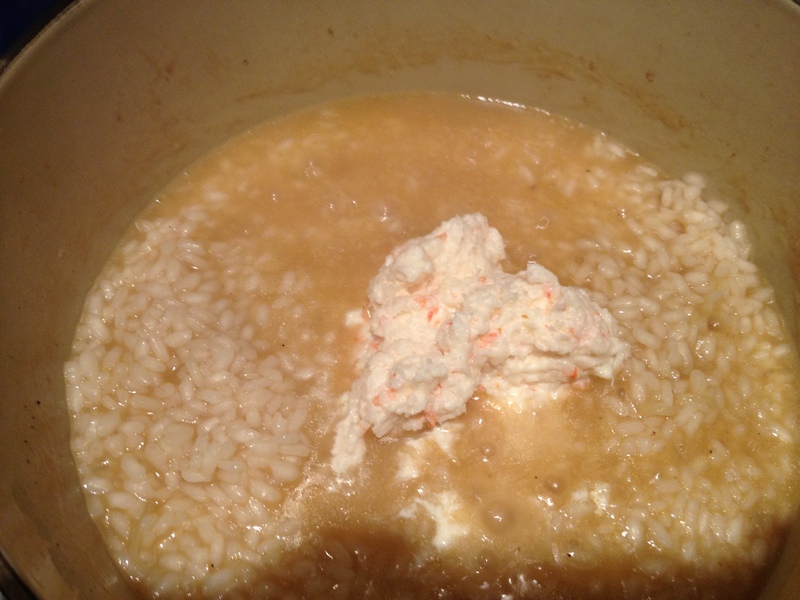 When the rice is ready, turn off the heat and stir in the remaining butter, this last step is called mantecare, which I cannot really translate but it makes the risotto perfetto (perfect), so don’t skip it! Spoon your risotto into serving bowl, sprinkle with freshly grounded pepper and top it with fresh prezzemolo (parsley) – which is typical – or, as I did, just decorate with a fresh, small foglia di salvia (sage leaf).